ReefClub Casino is a virtual casino which aims to provide casino game fans with an entertaining, relaxing experience within a safe, secure and regulated environment. It is owned by 888 Holdings plc. (one of the most popular online betting establishments) and was created in 2002. In addition, it is operated by Cassava Enterprises (Gibraltar) and is licensed by the Government of Gibraltar. 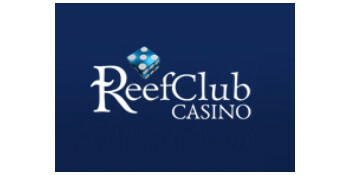 ReefClub Casino has an extensive collection of high quality casino staples such as Roulette, Baccarat, Blackjack, Craps, Pai Gow Poker, Video Poker, Caribbean Stud Poker, and various slot machine games which are a firm favourite with players. All its games are created using the highly impressive 888 software and are available in browser and downloadable versions although downloading the casino’s software provides an improved gaming experience for clients. Each game is also accompanied by a set of clear instructions enabling less experienced players to equip themselves with the required skills to maximize their gaming experience. ReefClub Casino has an average payout of 97%. ReefClub Casino offers a 200% Welcome Bonus to all new clients with a maximum value of £300. It also offers them an instant 100% First Deposit bonus with a maximum value of £150. Additional bonuses include the ReefClub Casino Sunday Funday prize draw which runs for 24 hours every Sunday and provides players with the opportunity to win prizes of up to £300 or 50 free FREAKY FRUIT spins. (Players who wish to participate must enter the promotion code ‘fun888’ when paying their deposit). The wagering requirement for the prize draw is x30. The Live casino Blackjack prize of £750 is offered to winning players at a Live Casino 888Xtra table in the 888 Private Room. This gaming event is held every day between 1pm and 1am (GMT) and also has a wagering requirement of x30. ReefClub Casino uses RSA public/private key encryption technology to ensure the complete security of private client data which is transferred over the internet. It also employs the use of robust firewall systems to be protect client account details stored on its secure servers. A significant portion of the virtual casino’s clients come from the United Kingdom as well as Germany and a number of other European countries . Access is however unavailable to residents of the United States of America, Turkey and Israel. Access to the members’ area can be obtained by downloading the casino’s software and completing the registration process. Once the client software has been downloaded and the registration process completed, access is provided to a user area set against a colorful backdrop. Also known as the lobby, ReefClub Casino members’ area provides links to main games categories including the Live Casino, Slot machines, Card and table games and video poker. Recently played games are also shown as well as the top games of the moment. Additional links also include account information as well as a practice portal where players can hone their gaming skills before taking the plunge and playing for real cash. The members’ area is clear with a tidy layout providing the clients an efficient means of promptly accessing the relevant gaming information they require. ReefClub Casino also provides regular players with rewards in the form of Comp Points for every deposit made. They may be converted into cash with £10 being equivalent to 1.5 point and 150 points to £1. All payment methods used have a minimum deposit amount of £10 with the exception of Visa QIWI Wallet, Chinese Local Bank Transfer Service and AstroPay Card which all have a minimum deposit amount of £20. Withdrawals from ReefClub Casino have a maximum limit of $30,000 per calendar month. Withdrawals may be processed using the credit cards or electronic wallets listed above. Clients are required to verify their identity before a withdrawal can be processed. Acceptable forms of identification include: Photographic ID (such as the copy of a passport, driver’s license or National ID card, a copy of the front and back of the credit card used to fund the client’s account and proof of address which may be recent a utility bill or a credit card statement. ReefClub Casino’s customer care team is available 24 hours a day and 7 days a week and may be contacted by telephone or by emailing [email protected] or [email protected] (clients will be contacted within 24 hours). The team is capable of handling enquiries in both English and German and its effectiveness in resolving complaints and handling client queries has been praised by fans of the casino. ReefClub Casino’s extensive games collection as well as their impressive graphics and effects have proven to be the online casino’s strong selling point. Its dedication to customer care and security as well as its generous jackpots and bonuses have also been praised by fans of casino games. However a number of reviewers have cited issues such as unresolved disputes and the poor layout of its website. ReefClub Casino focuses primarily on the European gambling market and on the United Kingdom and Germany in particular while being restricted to residents of United States of America, Israel and Turkey. In addition to an extensive games collection the casino also provides generous bonuses and jackpots. It also rewards frequent clients through the use of Comp Points ensuring that they can accumulate points and cash while being entertained at the same time.